When I got trained in mediation, we were told that you either did solo mediation (one mediator) or co mediation (two mediators). Since then, divorce professionals have learned that there are endless permutations of effective methods to mediate. In this post, I describe a few of the arrangements I have encountered in the 30 years I have been doing this. Integrated Mediation is the model that we developed here at Collaborative Practice & Mediation Services. It evolved from our experience with the interdisciplinary team approach used in collaborative divorce. In the Integrated Mediation model, we use two separate mediators: a credentialed financial specialist mediates the financial issues and a licensed mental health professional mediates parenting plan issues. Both mediators are committed to an effective outcome and work directly with the clients and their attorneys to help them maintain control over the process. We use the "tools" of collaborative practice as needed in the mediation sessions. What clients and their attorneys get are specialists in the areas where they have a need for expertise. How does the Integrated Mediation model work? Integrated Mediation brings together clients with mediators that are knowledgeable experts in the various aspects of divorce and the "tools" that will help them move through the stress and complexities in order to reach agreements that they and their children can live with. Integrated Mediation was created in response to current economic realities and has the potential for faster resolution and significantly lower overall costs. It can provide a framework to resolve issues that may arise following the divorce (adjustments to child support, parenting time and schedules). Most importantly it is conducted privately. Because the couple may start with either the financial mediator or the parenting mediator, separate Financial and Parent Plan sessions typically run on a parallel timeline determined by the clients. The mediators continually update progress with each other, and when useful the mediators will co-mediate a session. The financial mediator helps the clients explore ways to divide marital assets, minimize tax consequences, and determine levels of child and spousal support. The parenting plan mediator helps the couple to effectively communicate with each other, manage emotions, and develop a child-centered co-parenting plan to begin after their divorce. When sessions are concluded, the mediators summarize the understandings and agreements for the respective attorneys, who then work together to craft a settlement agreement. What we have found is that couples who thoroughly explore issues and reach a mediated agreement are more likely to comply with its terms. Each mediator may have a different skill set. This can be important if there are several different types of issues that must be resolved. For example, depending on the circumstances, a couple may want one mediator who is an expert in real estate transactions and another who is experienced in resolving child custody issues. Each party may feel more comfortable with a certain mediator. In a divorce in which one spouse is 20 years older than the other, it might make both sides feel more at ease to have two mediators who are in different age groups themselves. Also, some people may feel that only a mediator of their own gender will truly be able to understand their point of view about certain issues during the process. Sometimes it simply helps to have two mediators because it brings different perspectives into the process. The two mediators can complement each other and one may come up with possible solutions that the other one might not. Especially if certain issues appear to be at a standstill during the process, having a broader range of different points of view in the room can be a good thing. Détente Mediation (Collaborative Mediation) offers a fresh, innovative approach. One neutral family lawyer (mediator) and a counseling professional skillfully guide a couple over legal, financial, and emotional hurdles to reach well-informed private agreements that work for everyone. How does the Détente Mediation model work? 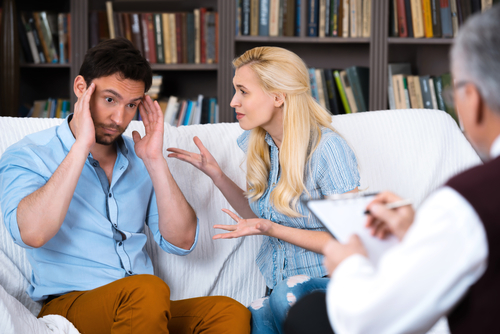 They use a team that consists of a neutral family lawyer and a couples counselor to help gather information, explore options, and negotiate equitable agreements. They use a dynamic communication technique that will empower the couple to talk and hear each other. Team Mediation is a structured process carefully designed by the Center for Mediation & Training, Inc. This process allows individuals to reap the benefits of mediation while affording each party the protection and guidance of their own attorney at the same time. In addition, it is a process that takes full advantage of specialists such as financial planners, creating a better life post-divorce. Most divorce professionals now recognize that divorce is a complex mixture of legal, financial, emotional, communication, and parenting issues. Imagine the couple that cannot communicate with each other but they do not want to go to court to fight it out. How does the Team Mediation model work? 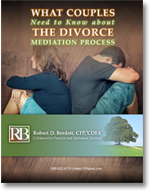 At the start of a "Team Mediation," the husband and wife agree to work with attorneys who are committed to this process. Each party can choose to either select a lawyer from the Center’s Team Mediation panel, or to propose Team Mediation to their own lawyer, who must agree to follow the Team Mediation Principles. be present during every session. be present at the first session, and thereafter decide which sessions their attorney will attend. not attend the first session, and thereafter assess the need to attend any particular session. never attend sessions, but be available for phone consultation during or after sessions. never attend sessions, but advise the client as requested during the course of mediation. Presently there are many models of mediation being used. They all have similarities and differences. I think what is most important is the end results for the parties. Can they reach resolution and be able to feel they have accomplished their concerns and objectives?